Who is it for? 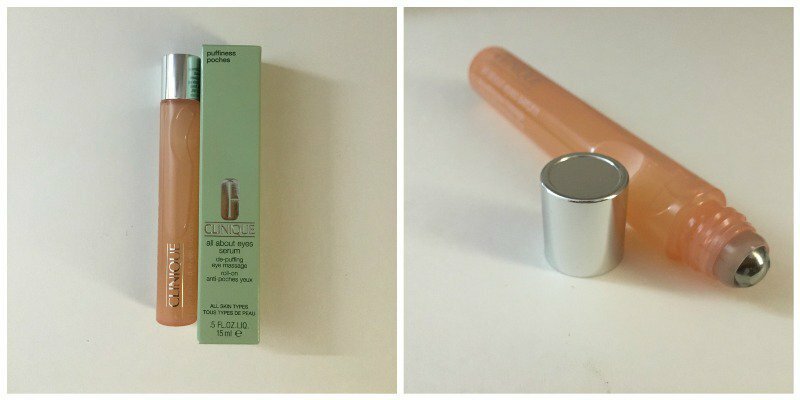 Clinique All About Eye Serum – De-Puffing Eye Massage Roll On is for those who wake up to fatigued puffy eyes and are looking for a roll on that can cool, soothe, de-puff and brighten them instantly. Just apply/massage under the eyes with the roll on directly. The serum comes in a tough, translucent plastic bottle which is pale pink in color with a metallic cap. The bottle has a metallic roll-on ball attached for the easy massaging application. The roll on bottle comes in a light pistachio green carton which has all the necessary details mentioned on it. It is pretty sleek and travel-friendly as it would fit in anywhere easily and wouldn’t leak at all. This product does what it claims. On application, the roll on feels cool against the skin and gently massages the tired under-eye area. It is pretty convenient and easy to apply. The serum gets absorbed within a few seconds without leaving behind any greasiness or oil. As a result of massaging the serum, the puffiness goes away in a few moments and the area around the eye feels soothed and refreshed. It is for all skin types. It does not really work on dark circles but it doesn’t even claim to do so, so that’s alright. However, at this price point, one may prefer a serum that can multitask. 1. Lightly messages the under eye area while de-puffing them. 2. Cools and soothes the under eye area. 4. For all skin types. 8. Fragrance-free and allergy tested. 1. Doesn’t do anything for dark circles. 2. Bit expensive, considering the fact that it doesn’t multitask. 3. Shelf life is just 6 months, which is pretty less if you don’t use it regularly. Well, why not, because it does what it claims. So if you face the problem of puffy eyes on a regular basis and can afford a product that is especially meant for this purpose, then go ahead. But at this price point, I would personally prefer a product that can multitask i.e., de-puff and diminish dark circles. Clinique Happy Heart + Cabana Crush Lip Gloss Duo ! Clinique Dramatically Different Moiturizing Lotion | Really Dramatically Different?